Incorporating a vitamin C serum into your morning routine will not only enhance your sun protection, it also protects your skin from free radical damage, promotes collagen production and lightens and brightens our skin tone. A true multi-tasker! Find a broad spectrum SPF 50 that you like the look and feel of to ensure that you wear it each and every day. So many of us skip our sunscreen application because we don’t like the heavy, greasy formula on our shelf. 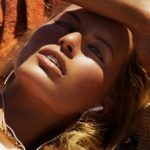 Sunscreens have come a really long way – there are a lot of different textures including breathable and mattifying formulas. Remember that the sunscreen in your makeup doesn’t provide sufficient protection and always apply the equivalent of a heaped teaspoon to cover your face, neck and décolleté. While sunscreen has come along way, it’s not foolproof. We can still accumulate so much damage on our skin, especially the décolletage, when wearing only SPF alone. Always wear a big hat and cover your chest with a rashie (zimmermann and Myraswim are my favourite) when you’re at the beach or outdoors for longer periods.